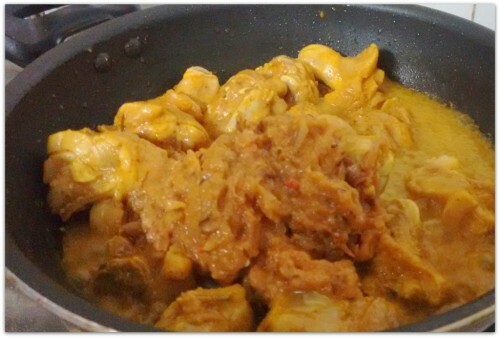 I was looking for a easy but tasty chicken curry recipe for a long time, and to find one I experimented a lot. 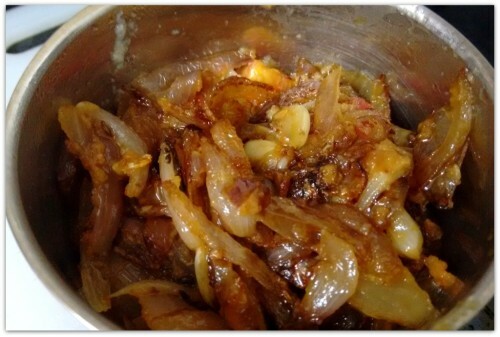 I tried different ways of preparing the onion, garlic and ginger; I tried different ways of cooking the chicken, slow cooking, pressure cooking; I tried marinating over night with different combination of ingredients. 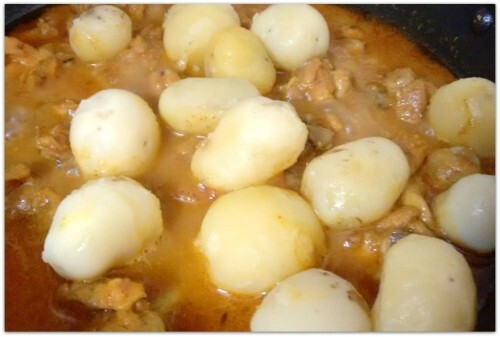 And finally I found one recipe, which is easy to make and yummy as well. What’s more, my two year old loves this dish. 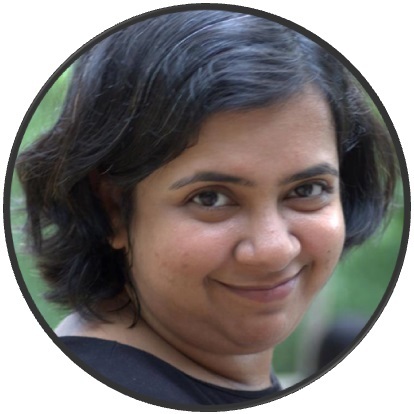 a pinch of my magic masala. 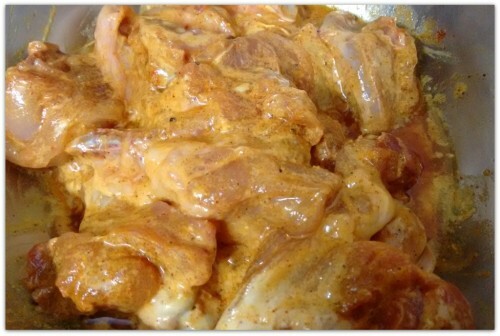 Marinate the chicken pieces with half of the spices, salt, 1 tbs of mustard oil and yoghurt. Don’t use sugar for marination. Keep it aside for half hour if possible. Otherwise let it marinate while you are preparing the other ingredients. I have used baby potatoes, since I ran out of normal sized potatoes the day I took the pictures. You can use normal potatoes. 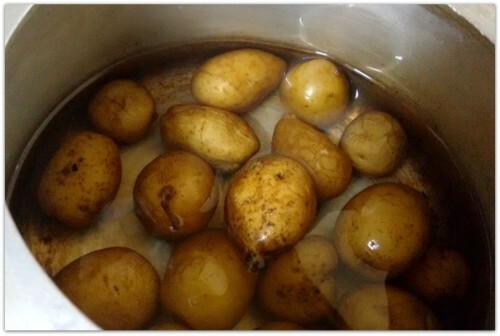 Cut them into four pieces each put them in a pressure cooker with some water and couple of table-spoonful salt. I give 6 to 7 whistles to cook the potatoes. While chicken is marinating and potatoes are cooking cut all the other whole ingredients. Does not matter what size you cut them, we are going to make a paste out of them soon. 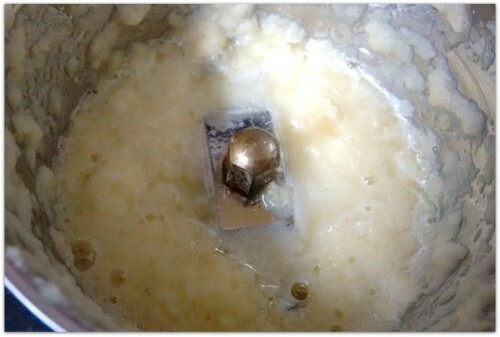 Put the garlic and ginger in a grinder with a spoonful of water and make a smooth paste. Keep them aside. 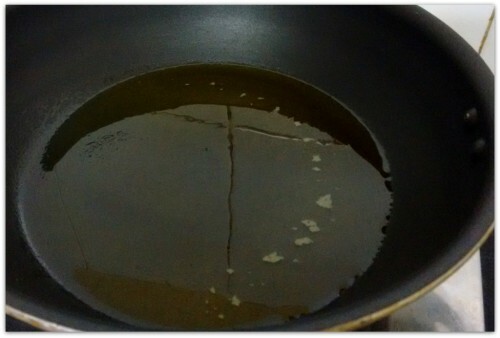 In a kadai or frying pan take some oil and wait till it is hot. 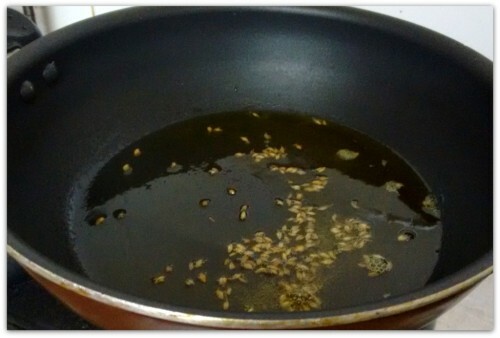 When the oil is hot, add some whole cumin seeds. 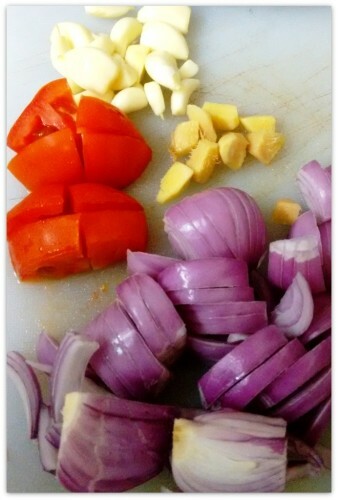 Sauté for few seconds. 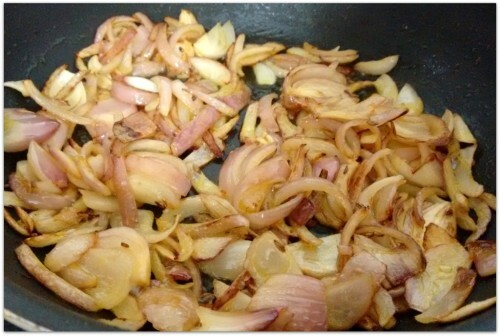 Now add all the onions and fry them till they are golden brown. 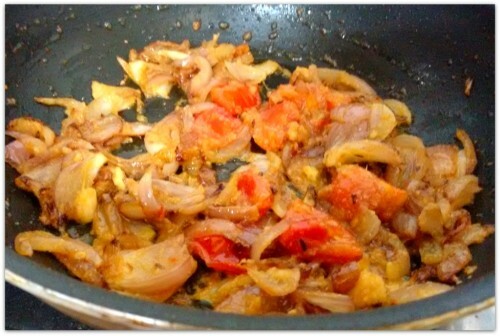 Add the tomatoes and sauté for a minute. Now add the ginger garlic paste, sauté for another minute. Now add rest of the spices and sugar and sauté for half a minute. Next put all the fired mashala into a grinder and make a smooth paste, it does not take much effort, just couple of small blitzs works. 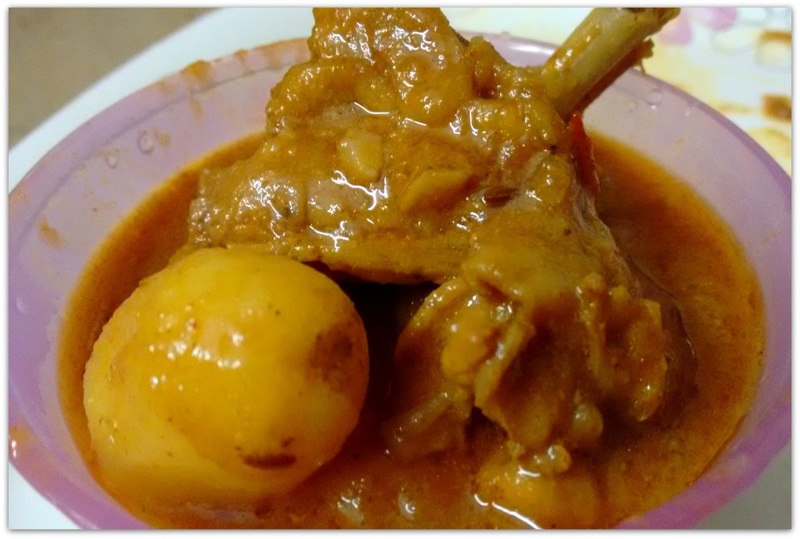 Be careful while making the mashala paste, it will be very hot. Also take care of putting some pressure over the cover of the container using both of your hands while making the paste, it has a tendency of making a mess by opening up due to the hot air pressure. 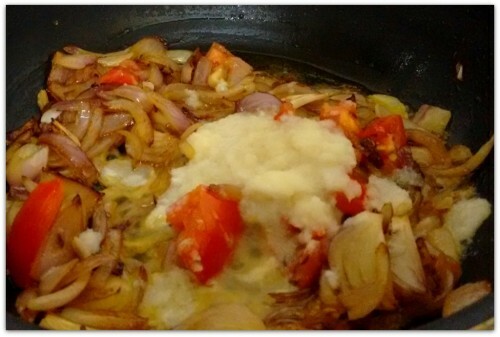 Now add the mashala paste, mix. Cover the pan and cook over high heat for five minutes. After 5 minutes, add a cup of water in the pan and bring the water in to a boil. When the water starts to boil, cover the lid, reduce the heat to minimum and cook for another 25 minutes. An occasional stir or adding little water in between if need will not harm. Now you can add the potatoes and cover the lid again. Cook for another 5 minutes in low to medium heat. 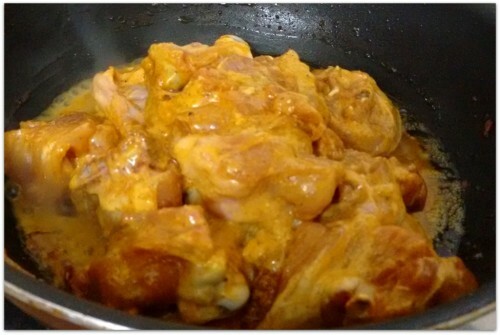 Your chicken curry should be ready to serve by now. 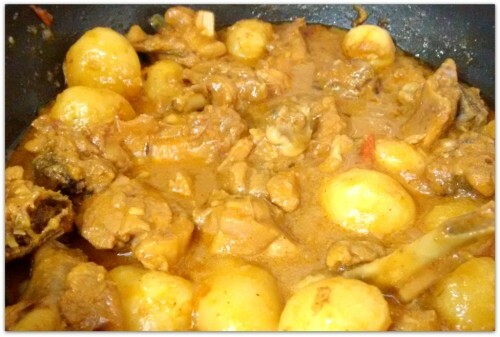 My version of chicken curry is a little bit towards sweeter side, however if you want hot, don’t add sugar and add red chilli powder instead of Kashmiri red chilli powder. Also you can make a paste of ginger, garlic, green chilli paste instead of only ginger-garlic paste. Add a cup of water, reduce the heat, cover and cook for 25 minutes. If needed add water in between. 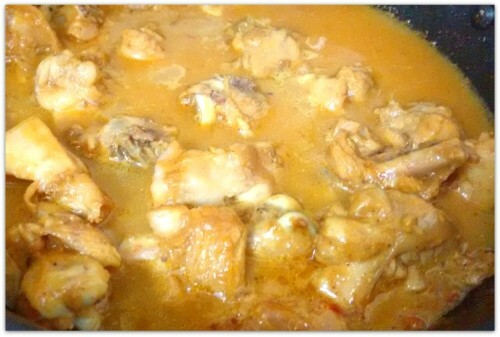 Chicken curry is ready to serve. 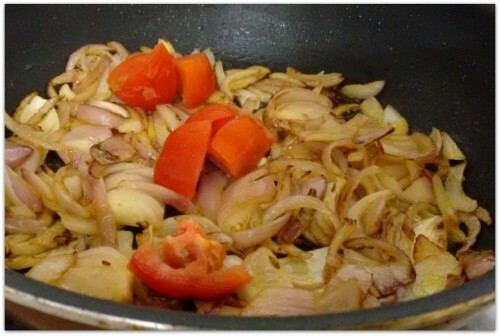 Why are u grinding the onion – ginger – masala – tomato mix after cooking? 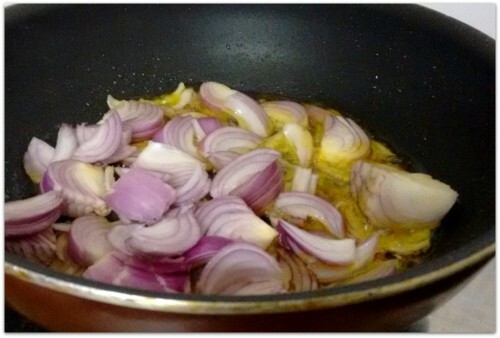 If you grind the onion before cooking it become very mushy and watery, however that does not happen after cooking. 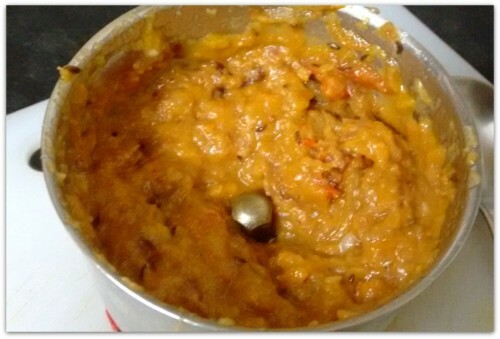 I wanted to have a smooth gravy so I needed make a paste of the masala, whereas if I do not make the paste then the onions and tomato will show. 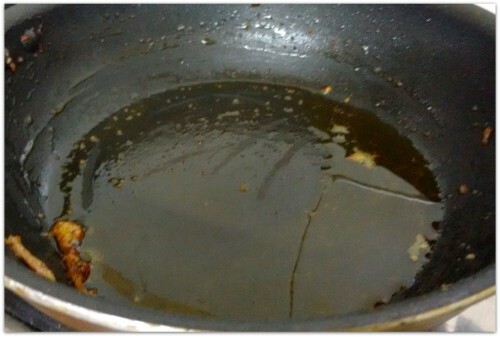 If you do this after frying them all up, then you have to make the paste only once,thus save time and effort. This is the reason I am making a paste after cooking. I hope I was able to answer your question.